There’s something dark and morose underlying Luke Painter’s surreal, methodical drawings installed at Le Gallery on Toronto’s Dundas Street West. While the compositions and their titles are playful in their kitschy pop-cultural references, the flattened perspective field, broken architectural fragments, and dampened chromatic tones create a sense of uneasiness within the viewer. Painter is traditionally trained as a printmaker, though over the last number of years his practice has transitioned to focus on drawing and painting with a compulsive—at times almost neurotic—attention to detail. These compositions are rooted in a pastiche appropriation of historical patterns and architecture beginning with the Arts and Crafts movement. In Rebound, his current solo exhibition at Le Gallery, Painter turns to the 1980s, pinpointing revivalist trends in the decorative arts: Louis Comfort Tiffany, Art Nouveau, Memphis design, Art Deco, and neo-Gothic architecture. This body of work seems to mark a transitional period for Painter. Previously, a number of his works included surreal, anthropomorphic topiaries. Intricately articulated fauna and lush domesticated landscapes still dominate in the current body of work, but their anthropomorphic qualities are more refined; they breathe and move in the compositions, but this movement is more tied into the repetition and movement intrinsic to pattern making. Similarly, there is a break in Painter’s use of architecture in this series; in the past, architectural buildings were rendered whole; now he is beginning to deconstruct these structures. Greenery organically seeps in and takes over the interiors of these spaces, suggesting an underlying sentience. Drawings such as Self Aware Plant and 1980’s Vanity (Michael Graves) (2013) allude to the ruinophilia that romanticizes the utopic vision of futuristic 1980s decorative movements. Using 3-D software and deliberately muted tones in order to reference early chromolithographic printmaking, Painter, despite his adherence to historical referents, approaches the works in Rebound with a refined sense of humor. Cathedral (Neon Gothic), one of the larger works in the show, wittily pokes fun at neo-Gothic architecture by inserting swatches of pink neon on the façade of a classic Gothic edifice. 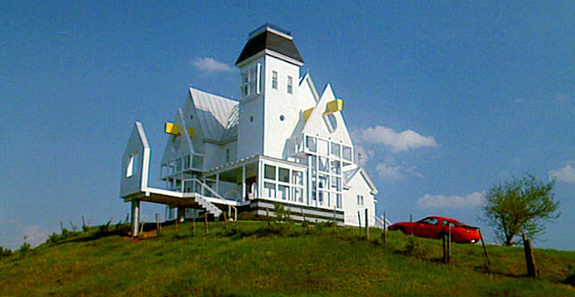 PoMo Reno (Beetlejuice Beetlejuice Beetlejuice) takes some of the over-the-top design elements from the Deetz family’s renovated home in Tim Burton’s 1988 film Beetlejuice, including the frame of the house itself, and combines them with what could perhaps be read as a comment on anti-climactic dissolution with the abrasive, hard edges found in 1980s architecture and industrial design. Despite these rectilinear details, the house appears to be in transition, returning to nature. Painter juxtaposes the cold, hard edges of early postmodern design with the organic warmth of Tiffany’s classic, cascading Art Nouveau patterns. While most compositions in the exhibition juxtapose these competing aesthetics so that the Tiffany-inspired elements almost melt into the deconstructed architectural backgrounds, Cavern (Tiffany Wysteria) brings the exhibition full circle. In this piece, the decorative organicism of the Tiffany-inspired wisteria swallows the skeletal architectural remains. Rebound is on view at Le Gallery, Toronto, through September 29, 2013.